Three squares are so passe. Snacking is having a moment, and — you’re driving it. You could be a 25-year-old Instagram-loving foodie, who shares daily updates of your homemade mini-meals and trendy restaurant tapas. Or a 33-year-old budding entrepreneur, who opts for smoothies and meal replacement bars because you don’t have time to shop, but have no time for junk food, either. Or a 41-year-old father, who indulges in a daily Starbucks run with co-workers. Or a 65-year-old retiree who isn’t up to preparing dinner anymore and opts for a bowl of popcorn or ice cream instead. Consumers are driving food industry players — manufacturers and restaurants — to introduce items that satisfy a rapidly growing appetite for smaller meals that can be consumed on the run, even though it may not be the healthiest way to10 eat. Whether the fear of calories posted on restaurant menu boards is causing us to order smaller meals or hectic schedules are driving us to this new kind of eating, major food companies have caught on in a big way. “The tradition of a piece of fruit or a handful of nuts as a snack — those are still there, but overall the definition of a snack has dramatically changed,” said Technomic President Darren Tristano. Snacks spell big opportunity for food companies because they tend to be more expensive than traditional meal components. And one look around a grocery store shows that retailers like their potential too, as snacks get more prominent space on shelves, with some healthier fare being stocked in the produce department. At cereal powerhouse Kellogg, whose brands include Pringles, Cheez-It, Keebler and TownHouse crackers, snacks have gone from 20 percent of its business in 2000 to almost 50 percent today. This year, the company expects brands that have been struggling, like Kashi and Special K, to lead the growth. Both saw strong sales in the early 2000s, but fell out of favor when consumers steered away from “diet food,” Kellogg CEO John Bryant said on a conference call last week. The brands have been revamped, and boxes include buzzwords like “nourish” instead of “diet,” and Kellogg is focusing the brands on hand-held forms, instead of just cereal by the bowl. “The expectation of consumers in the snack market has changed,” he said. But Kellogg also expects brands like Pringles and Cheez-Its will be strong, and it is hurrying to develop more single-serve packages for its snacks so they become a grab-and-go item in a convenience or drug store. At Hormel, whose meat brands including Jenni-O and Spam, it’s Wholly Guacamole that’s stealing the show, particularly in single-serve containers, according to CEO Jeff Ettinger. Hormel also recently introduced Skippy PB Bites with either a crunchy peanut butter or pretzel core. 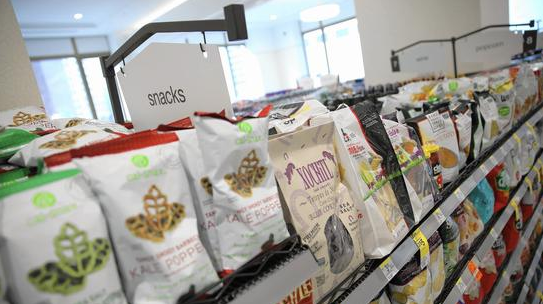 Oak Brook-based TreeHouse Foods used to count beverages as its biggest category, but a 2014 acquisition propelled its snacks category to No. 1, and it now says it’s the largest private-label trail mix maker in the U.S. Even health care companies are entering the snack market. Abbott Laboratories, maker of Pedialyte, Ensure and Similac formula, earlier this month launched a line of snack bars called Curate aimed at adults seeking healthier alternatives to chips or cookies. And last month, Chicago-based Hillshire Brands introduced a line of snacks aimed squarely at the young Instagram-addicted foodie, launched at a VIP event in New York with a former “Top Chef” contestant and Bravo’s Andy Cohen. The snacks include chicken bites with sauces like mango habanero and spicy chipotle and “small plates” of salame, cheese and crackers. He said sales of the new line have exceeded expectations. Millennials, the largest segment of the U.S. population, are driving the snacking industry to create more fresh, healthy and protein-packed options, but other generations are partaking as well. People tend to snack more as they age, in part because older adults don’t have young families to cook for, said Darren Seifer, an NPD Group food and beverage analyst. The biggest snackers are those 55 to 64, NPD’s research shows. But more snacking doesn’t always mean hitting the vending machine for a bag of M&Ms. Americans are eating fewer sweet snacks, choosing to save them for an evening indulgence, Seifer said. Their consumption fell about 5 percent in the past decade, compared with savory snacks like chips and beef jerky, which grew by 7 percent in the same period. Meanwhile, so-called “better-for-you” snacks like yogurt and cottage cheese cups have grown 25 percent. “We start off the day with the best of intentions and then about 8 p.m., after you put the kids to bed, we’re allowing ourselves a bit of indulgence,” he said. Deerfield-based Oreo maker Mondelez has seen both sides of America’s snacking obsession. Spurred by slowing sales of sweet snacks, it introduced Oreo thins to cater to those who want a healthier version. Mondelez, which also makes Ritz crackers, Cadbury chocolate, Sour Patch Kids and Honey Maid graham crackers, says it’s also focusing on smaller sizes for its brands to cater to snackers. The company already derives 85 percent of its sales from snacks, up 10 percent from a year ago, and it sees a great deal of growth potential this year. “Why do we like snacks so much? Quite simply, because of their growth potential. Snacking is a $1.2 trillion market, and it’s growing everywhere around the world,” said Mondelez CEO Irene Rosenfeld at a conference last week. Smaller, more frequent meals may appeal to many Americans, but they’re not necessarily the healthiest option. In general, frequent snacks lead to “more dishes, more calories, and they’ve also hampered people’s decision-making abilities” because people can use snacks as an emotional crutch, Fear added. This entry was posted on Friday, February 26th, 2016 at 10:00 am and is filed under All-Natural, Growth, Growth Opportunities, health & wellness, healthy, Rebrand, Snacking, United States. You can follow any responses to this entry through the RSS 2.0 feed. You can leave a response, or trackback from your own site.